Petron, the country's leading oil company, recently announced its biggest marketing promotion for the year with the Petron Doble-Panalo promo. Starting 01 November 2011 to 31 January 2012, Petron customers have two chances to win prizes from Petron stations nationwide. First, with every P1,000 single or accumulated purchase of Petron fuels — Petron Xtra, Petron XCS, Petron Blaze, Petron DieselMax and Petron Turbo Diesel — a customer is entitled to "Pick a Raffle Coupon" with an instant prize from the bunot box. 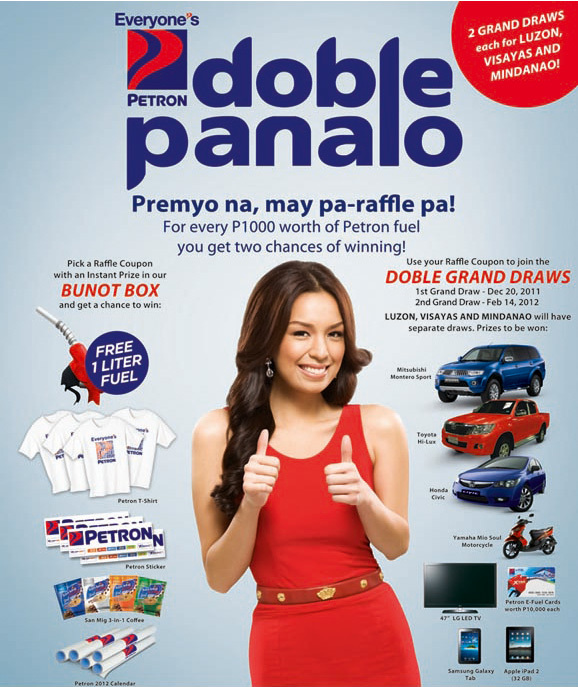 Instant giveaways include: free 1-liter fuel, Petron t-shirt, Petron sticker, San Mig 3-in-1 coffee, and Petron 2012 calendar. The same Raffle Coupon can then be used to participate in the Doble Grand Draws, which will have separate draws and separate winners of same set of prizes for Luzon, Visayas and Mindanao. The First Grand Draw to be held on 20 December 2011, will have the following prizes at stake: Toyota Hi-Lux (3), Honda Civic (3), Yamaha Mio Soul motorcycle (3), 47-inch LG LED TV (6); Samsung Galaxy Tab (6), Apple IPad 2 - 32GB (9), and Petron E-Fuel Card worth P10,000 each (48). The Second Grand Draw, for entries submitted by 31 January 2011, will be held on 14 February 2012. Grand prizes include: Mitsubishi Montero Sport (3), Yamaha Mio Soul motorcycle (3), 47-inch LG LED TV (6), Samsung Galaxy Tab (6), Apple IPad 2 - 32GB (9), and Petron E-Fuel Card worth P10,000 each (48).